Dylan Powell is back on the show to not only give us an update on the Marineland Animal Defense campaign but to also talk about the ways that MAD and Shark Allies Niagara have dealt with the threat of SLAPP lawsuits (Strategic Lawsuit Against Public Participation). An important conversation considering the current climate of repression to environmental and animal rights activists. 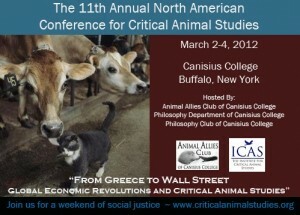 After the break Kimberly Socha joins Dylan Powell to talk about the 11th Annual North American Critical Animal Studies Conference in Buffalo, New York from March 2-4, 2012 at Canisius College. We even get hear a little bit about Socha’s new book, “Women, Destruction, and the Avant-Garde: A Paradigm for Animal Liberation” the first publication of a new Critical Animal Studies book series. Tags: Dylan Powell, Kimberly Socha, Marineland Animal Defense, Shark Allies Niagara, Sharks. Bookmark the permalink.